Amaro Nonino. The feminine mystique of amari. The delicate flower of distillates. The showy ruffles and sweet, ethereal perfume of elixirs. I can rhapsodize for days about this lovely ether. I have a friend who is also obsessed with Amaro Nonino as well. However, more than the amaro, he always talks about how beautiful the women in the Nonino family are- as you can see in the photo above, he wasn’t exaggerating! Amaro Nonino is one of my favorites for sipping neat, because it is so balanced and lovely- I don’t want anything interfering with the flavors and aromas. I think the quality of the end product is truly derived from the sum of its parts: Amaro Nonino grappa (another Nonino specialty), which is then infused with herbs, and other ingredients such as bitter orange, rhubarb, saffron, sweet orange and tamarind. The fact that at its base Amaro Nonino has a high quality grappa component (made from a blend of Ribolla, Traminer and Verduzzo grapes) makes me appreciate it even more. The Nonino family has spent decades devoted to the artisanal production of traditional Italian spirits. They have also spent a great deal of energy promoting and protecting some of the rarest indigenous grapes in Italy. The grapes shown above were photographed by Jeremy Parzen, the Italian Wine Guru who is currently documenting a mixologist trip to Nonino. These are Picolit grapes: some of the rarest in the world, let alone Italy. The fact that the Nonino family not only cultivates them, but then turns them into a single varietal Grappa is pretty much AWESOME. Just another reason why I love the world of Italian wine- there is a streak of passion so strong it borders along the lines of insanity. This kind of commitment to the autochthonous, and single-minded dedication to tradition is hard to find anywhere else. Bravi! 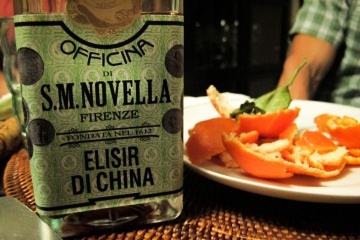 Follow the Mixologist’s Adventure in Friuli with Nonino Here! Thanks for reporting back form the front lines! We are all living vicariously!